Originally published under the title "Keith Ellison Risks Legitimizing Extremists." Rep. Keith Ellison addresses the Democratic National Convention in Philadelphia, July 25, 2016. The Democratic National Committee recently banned a candidate from the chairmanship race, after he claimed that fellow-candidate Keith Ellison, a Muslim Congressman, was unfit to lead the party because of his religion's opposition to homosexuality. There is no evidence that Ellison himself is anti-gay, and it was unfair to suggest as such. Ellison does have a history, however, of sharing platforms with some of the most extreme anti-gay preachers in America. In April, Ellison is billed to speak at a conference organized by the Islamic Circle of North America (ICNA) and the Muslim American Society (MAS). Ellison will be sharing the stage with an assortment of clerics known for their extremist rhetoric – including Siraj Wahhaj, who cites the death penalty for homosexuality, which he describes as a "disease," and labels non-Muslims as "foul" and "corrupting." Under a Trump administration, some Democrats may feel particularly drawn to declaring solidarity with American Muslim communities. Islamist groups know this, and will seek to exploit the company of politicians who are keen to broadcast their anti-Trump credentials. Political patronage gives credence to the claim of Islamists to be community leaders – to be legitimate representatives of ordinary Muslims (who are given little say on the matter). It serves to distract attention away from their extremist ideas and links to terror. And it gives them an opportunity for influence that, as a minority group of extreme political operatives, they would otherwise never wield. Islamists will seek to exploit the company of politicians who are keen to broadcast their anti-Trump credentials. If all goes as expected in February's DNC leadership elections, Representative Ellison could be addressing the ICNA-MAS conference in Baltimore as the newly-minted DNC chairman. For ICNA-MAS and its conference speakers, Ellison's presence means the support of the liberal anti-Trump establishment. It means the whitewash of illiberal Islamism. 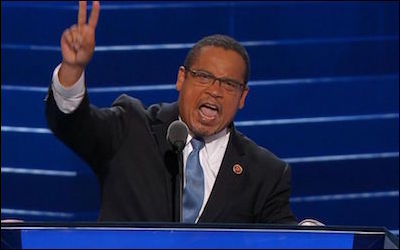 In December, Ellison withdrew from a similar conference, also organized by MAS and ICNA, after the Middle East Forum and its allies published research showing that almost half of the speakers had made comments advocating for jihad, promoting anti-Semitic and homophobic ideas, or praising terrorist groups such as Hamas. Several of those same extremist speakers are now also listed to speak at the conference in April. Has Ellison agreed to attend the ICNA-MAS conference because the DNC election campaign will be over? Or perhaps it is simply because he is not aware some of the same extremists he distanced himself from in December will be again sharing his platform in April. In case Representative Ellison is simply uninformed, he should know a little more about at least one of his fellow speakers. Siraj Wahhaj is a preacher with a long history of involvement in extremist causes. In 1995, the U.S. Attorney for New York named Wahhaj as an "unindicted co-conspirator" in the 1993 World Trade Centre bombing. Wahhaj also served as a character witness for Omar Abdel Rahman, the notorious terrorist operative, whose group was responsible for the attack. Newly-discovered sermons now reveal the full extent of Wahhaj's extremist ideas. Wahhaj has advocated for jihad in America, and fundraised for the Benevolence International Foundation, a prominent front group for Al Qaeda, now banned. Elsewhere, he describes American society as "satanic," supports "chopping off the hands" of thieves, advocates "death by stoning" for "adultery or fornication", and labels non-Muslims as "dirty" and "corrupting." Wahhaj reserves quite a bit of his hatred for homosexuality. "The Prophet," Wahhaj claims, "cursed the feminine man and the masculine women. ... Brothers and sisters, I don't believe any of you are homosexual. This is a disease of this society." Feminist movements, he adds, "are headed by lesbians." Left to right: Siraj Wahhaj, Yusuf Islahi, and Yasir Qadhi. Although Wahhaj advises his audience not to "beat up homosexuals," he nevertheless reminds them: "You know what the punishment is, if a man is found with another man? The Prophet Mohammad ... said the one who does it and the one to whom it is done to: kill them both. Wahhaj is not the only extremist advertised to speak in April. Others include Yusuf Islahi, who claims that Jews were behind the 9/11 attacks, as part of a conspiracy to defame Islam; and Yasir Qadhi, who incites hatred against Shia Muslims, and has described the Holocaust as "false propaganda." The hosting organizations have their own history of extremism. In 2014, MAS was designated by the United Arab Emirates as a terrorist organization. 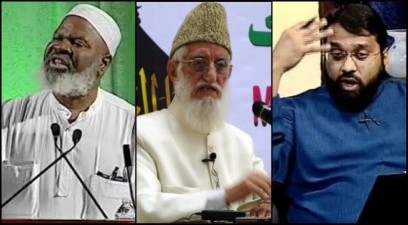 And ICNA is the American arm of Jamaat-e-Islami, a violent South Asian Islamist group that carried out mass-killings of civilians during the 1971 Liberation War in Bangladesh. Politicians who oppose the Trump administration must take care not to ignore the danger of Islamism. As a congressman, Keith Ellison is perhaps just another liberal politician being exploited by illiberal Islamist groups. But as a possible DNC chair, he would be lending the legitimacy of the Democratic Party to some of the most abhorrent Islamist clerics and activists in America today, and betraying the trust of moderate American Muslims. Politicians who oppose the Trump administration must take care not be so anti-Trump that they ignore the danger of Islamism. If politicians across the spectrum are serious about tackling extremism, radicalization and terror, they must deny Islamists the liberal stamp of approval. Keith Ellison, whether as Chairman or Congressman, must withdraw from this conference. Sam Westrop writes for Islamist Watch, a project of the Middle East Forum. He is director of research for Americans for Peace and Tolerance.